Rescue divers secure a flotation ring around a mockup of NASA’s new Orion spacecraft during water splashdown tests in Florida in 2009 (Credits: NASA/Dmitri Gerondidakis). NASA is setting up the mission rules for the Orion spacecraft with a Concept of Operations (CONOPS) that includes scenarios for keeping a crew alive after end of mission splashdown. The scenarios include off-nominal landings to remote areas of the ocean, and crew rescue by US Department of Defense (DoD) assets. During the last thirty years, Space Shuttle crews have been landing at Kennedy Space Center, with an alternative option being Edwards Air Force Base in California, or even White Sands in New Mexico, where STS-3 landed in 1982. In case of a sudden mission abort, a database based on Google Earth provided the crew with thousands of runways all over the world for emergency landing. 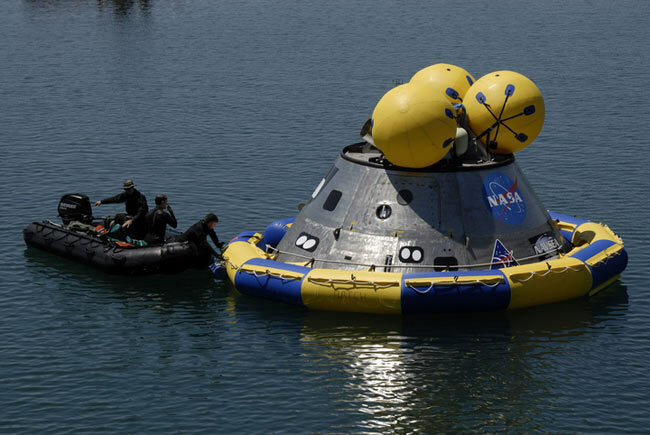 With Orion, NASA will be returning to the old days of water landings. In an emergency situation such as a hardware issue or a health–related problem resulting in a pad or ascent abort, the module and its crew would splash down just off the American eastern coastline, up to 450 km far from the launch pad. The exact distance would depend on the time the abort was called during the ascent. Following this scenario, astronauts would be rescued within minutes. An abort in a later phase would result in an Untargeted Abort Splashdown (UAS) in the Atlantic or in The Indian Ocean, and would therefore require a longer time for rescue. As with all splashdown scenarios, the crew would have a satellite phone at their disposal to communicate with Mission Control, who would be coordinating the rescue. Orion is designed to protect the crew until recovery forces reach the splashdown area. Once the capsule hits the water, an automated sequence takes place, cutting the main parachutes and activating the Command Module Uprighting System (CMUS) which ensures the “face down” postion of the module and prevents antennas from going under water. After the module’s power down, a cooling system ensures bearable temperatures inside the capsule for two hours. If the recovery forces need longer to reach the splashdown area, a snorkel fan would provide the crew with fresh air. In this scenario, the vehicle would need to be purged of toxic ammonia and hydrazine, while three sensors verify that the area is free from toxic vapors. In case of flotation issues, the crew can release a side hatch to escape the module and deploy a life raft. In nominal cases, the Orion module is conceived to protect its crew for at least 24 hours. The rescue forces, a trained DoD team, would arrive from the air, dropping small rescue boats for quick access to the capsule. Additional boats providing supplies and emergency assistance to the crew would follow, along with a large US Navy recovery vessel, the ultimate actor of the rescue mission.